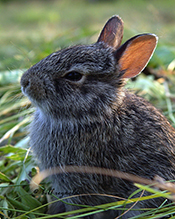 This is the smallest of Minnesota’s Leporidae, weighing 2 to 4 pounds at maturity. 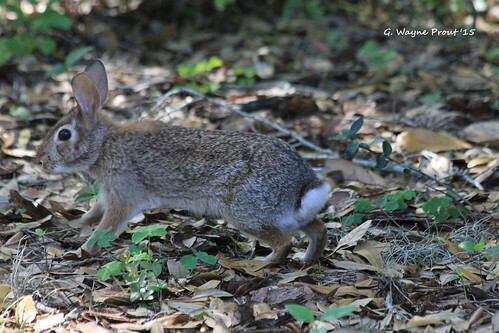 Mearns’s cottontail (Sylvilagus floridanus) is rusty-brown in color. Nebraska cottontail (Sylvilagus floridanus similis) is gray. 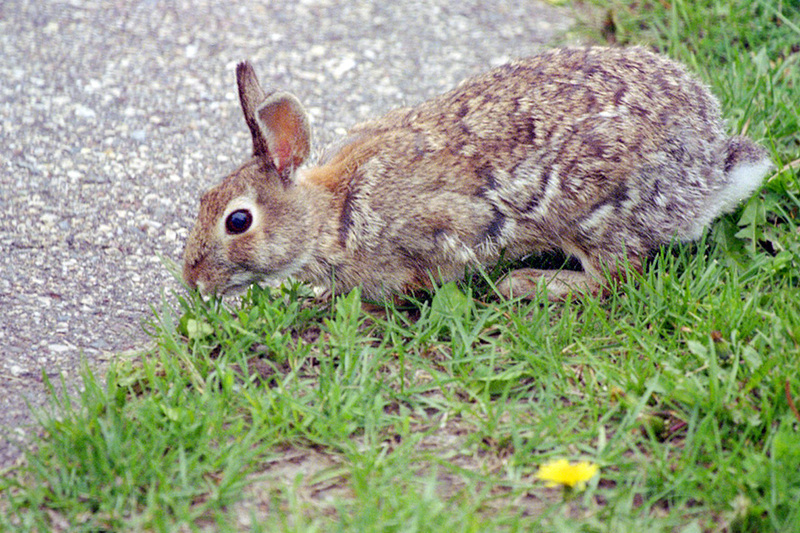 Snowshoe hare (Lepus americanus), found in northern Minnesota, is slightly larger than the eastern cottontail. It is uniformly dark brown in the summer and turns white in the winter. White-tailed jackrabbit (Lepus townsendii) is much larger, weighing 5¾ to 9½ pounds at maturity. It turns white in the winter. 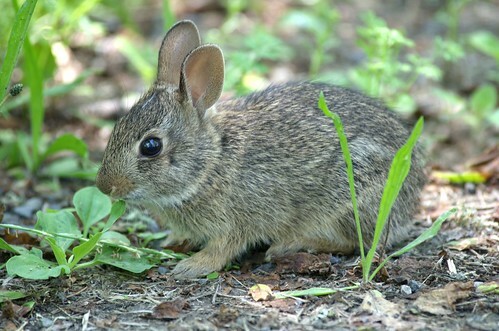 In the spring, summer, and fall, the eastern cottontail feeds on a wide variety of plant matter, including grasses (about half of it’s diet), clover, wild strawberry, cultivated and wild flowers, and many types of cultivated crops. During the winter months they feed on twigs, bark and buds of oak, dogwood, sumac, maple and birch. They may girdle fruit trees and ornamental shrubs. 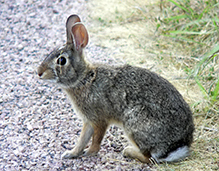 Mearns’s cottontail (Sylvilagus floridanus mearnsi) is found throughout the state except for the northeast corner and the western portion of the northwestern counties. 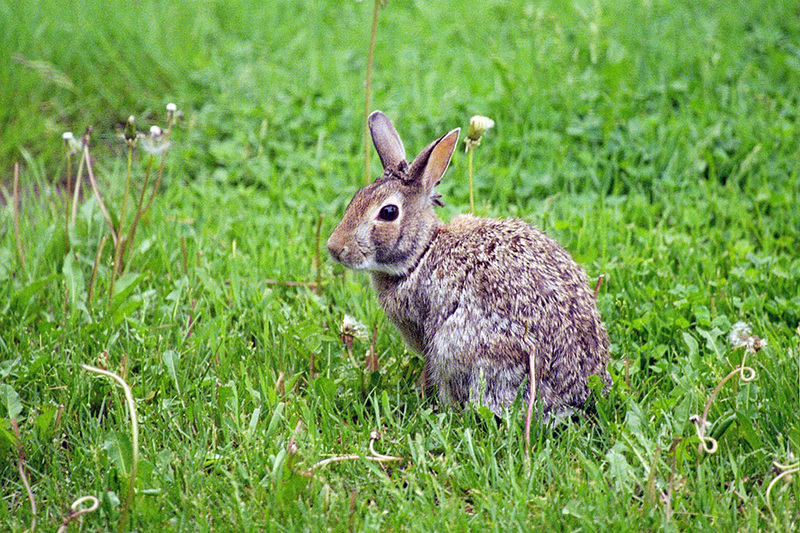 Nebraska cottontail (Sylvilagus floridanus similis) range extends into Minnesota only in the western portion of the northwestern counties. 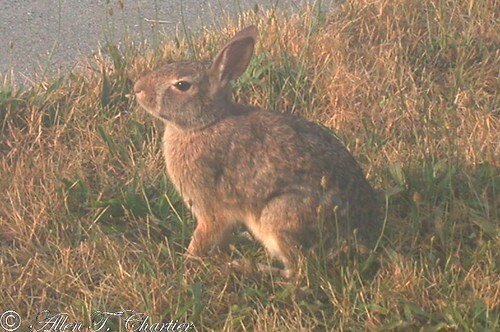 The eastern cottontail (Sylvilagus floridanus) is found in a wider variety of habitats than any other cottontail (Sylvilagus) species. Any habitat that includes well-distributed, dense shrubs for escape cover interspersed with open, grassy areas is ideal for this species. 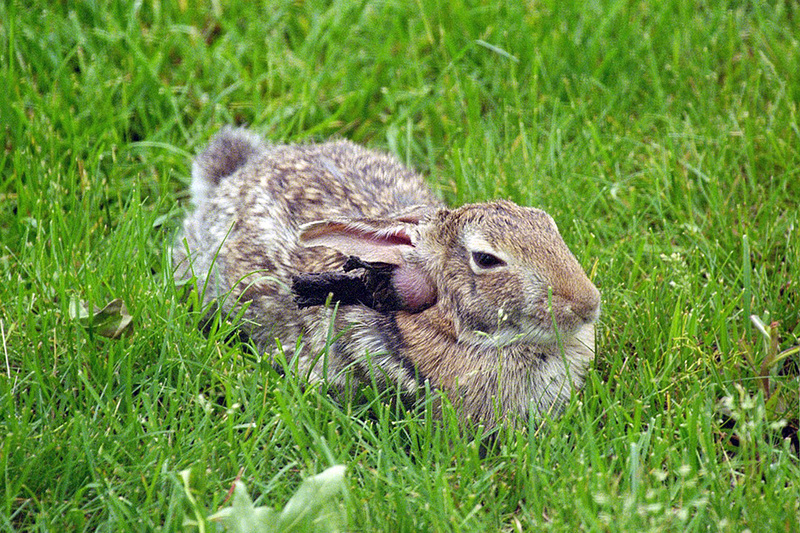 This is an Eastern Cottontail rabbit ripping up my lawn to make a nest in the backyard! So cute and such a busy worker! She obviously doesn't work for the state because there would have been 6 other rabbits sitting around watching her and drinking iced coffee. An eastern cottontail rabbit forages for spilt seed beneath a bird feeder in the teeth of raging blizzard at Grand Forks, North Dakota (18 February 2013). I live at Episcopal Homes of MN at University W. & Fairview. 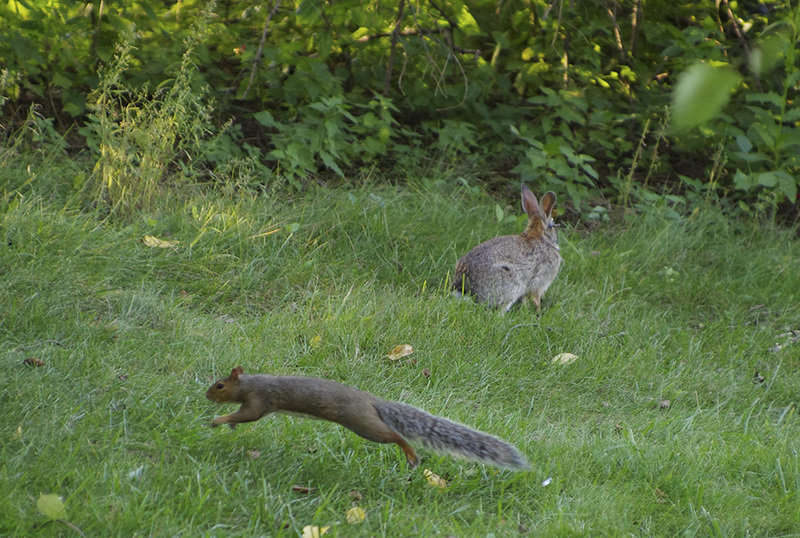 We have some resident wild rabbits which I think are Eastern Cottontail. In the warmer months I often see them eating the clover and grass on the lawns by our buildings at dusk. I see them only on the inside of the connected complex of buildings – not on the lawns on the street sides of our buildings. Nor do I see them in the small city park next to Episcopal Homes. All this makes me think they are confined or trapped by our continuous buildings. The only real exit is on to University. My question is: How do they survive in the winter? I see them out occasionally at dusk in the snow or where the snow is pushed aside or bare spots under shrubs & trees, but even that doesn’t seen like enough to sustain them through the winter. I found a dead bunny last spring next to our building by some shrubs. Is there any thing I can do to support their life? Food? Plants? Hay? Shelter? etc. Things to avoid? I have read quit a bit on line, but my questions are not answered. Some parts of your website I could not open. it is easy for you to get at every day. For me, that place is by a basement exit under an outdoor, second floor deck. I make three small piles, well-spaced, a third cup each, so the three rabbits can all eat at the same time without fighting over the food. Note the gray fur color. This is a Nebraska cottontail (S. f. similis).